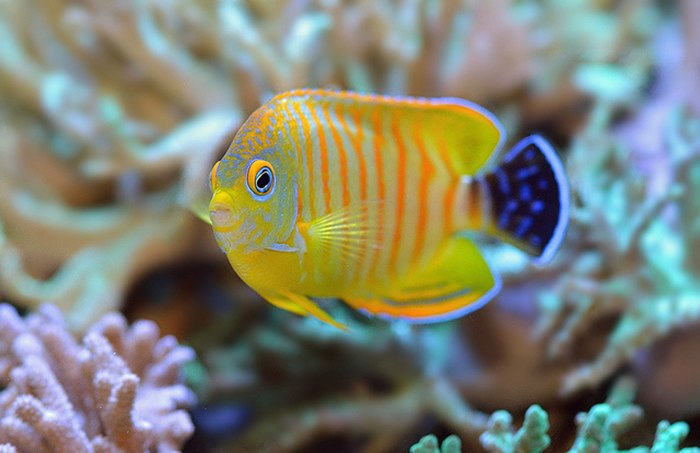 Home / Fish / The Cocopeel Angelfish Inspires A Good, Old-Fashioned Taxonomy Fight! The world of taxonomy is, more often than not, a stolid and staid affair, but every now and then a species comes along that gets everyone’s blood a-boiling. 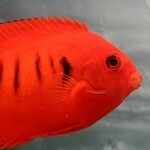 Such is the case with the beautiful and enigmatic Cocopeel Angelfish. 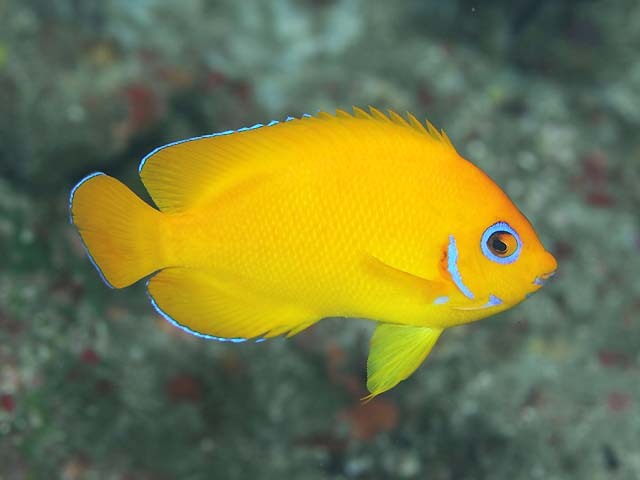 It wasn’t long ago that this vibrantly colored fish from Cocos Island was considered to be just a unique population of the widespread Lemonpeel Angelfish (Centropyge flavissima). But, curiously enough, that species occurs far, far away in the Central Pacific, raising the obvious question of whether these geographically disjunct fishes really could be the same. Adding to this refrain, the two are also subtly different in their eye coloration (blue vs. yellow), as well as the presence or absence of a blue ring around the eye itself. Yet, still, the question lingered in the air… are these different species? The answer seemed to come last year when the Cocopeel was scientifically described as C. cocosensis, but the authors of that paper noted that there was essentially nothing genetically that distinguish it from the nearby C. eibli. Obviously, this raised some question regarding its validity, and these concerns seemed to be answered in another paper (DiBattista et al 2016) that followed shortly thereafter which sampled many more specimens and which once again showed that C. eibli and the Cocopeel are more or less identical genetically. And so these authors dismissed the notion that C. cocosensis was truly distinct. This, dear reader, is what future historians will look back upon as the beginning of the Great Centropyge Wars. 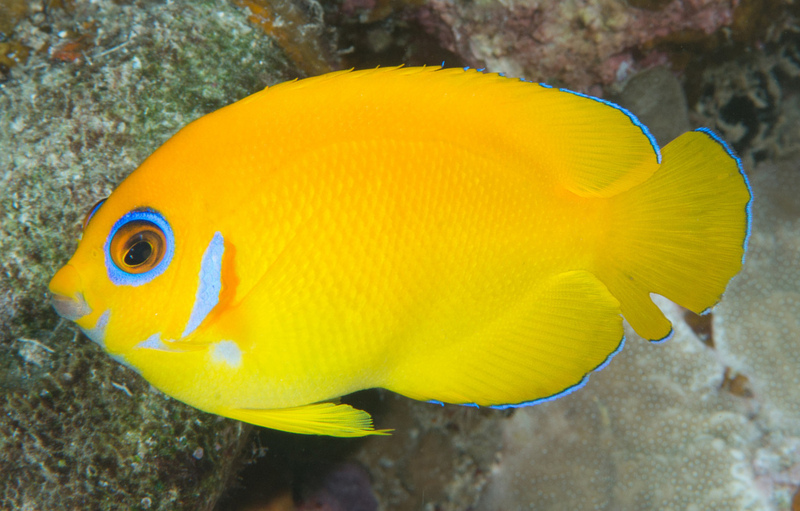 In yet another new paper which was recently published in the Journal of Heredity, the original authors of C. cocosensis argue that the obvious differences in coloration which separate the bright, yellow Cocopeel from the orange-striped Eibl’s Angelfish are more than enough to warrant species distinction, even without an obvious genetic mechanism to separate the two. In its natural habitat, the Cocopeel is actually said to be the dominant form at Cocos and nearby Christmas Island, with C. eibli and the related C. vrolikii being considerably less-common. In essence, their point is that C. cocosensis functions as a species, so let’s just call it one. They go on to point out an apparent double standard in how we classify this species complex. In the Central Pacific, the fish we know as C. vrolikii and C. flavissima don’t correspond to their genetic heritage. 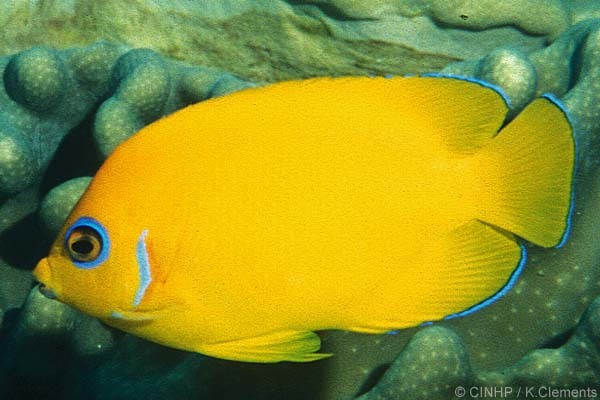 Phylogenetically speaking, the “true Lemonpeel Angelfish” is actually found only in Polynesia, while the yellow Centropyge that populate Micronesia and Melanesia are instead much more closely related to the Half-black Angelfish. 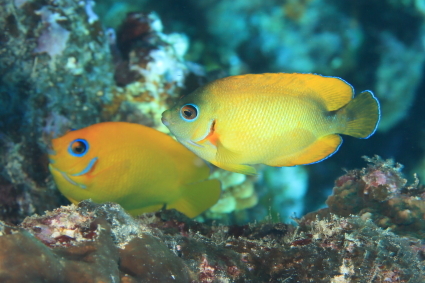 These are, in a sense, a “false Lemonpeel Angelfish”, as, genetically speaking, they appear to be nothing more than a xanthic variation of C. vrolikii. And this is where the double standard comes in—if DiBattista et al argue that the Cocopeel is just a xanthic C. eibli, shouldn’t they also argue that these “false Lemonpeels” are really just xanthic C. vrolikii, as the genetics suggest? Naturally, DiBattista et al continued this taxonomy fight with their own rebuttal to this rebuttal. The point these authors make is that geography, in addition to genetics and appearance, must be taken into account when delineating species boundaries. 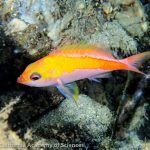 For the Cocopeel, even though it is numerically dominant in its tiny Eastern Indian Ocean range, it is also fully sympatric with both C. eibli and C. vrolikii, and it’s even known to form stable mixed-species harems that can last for years. On the other hand, the various populations of Lemonpeels—Polynesian, Micronesian, Melanesian—can be thought to form a single cohesive geographic population which only hybridizes along its peripheries with C. vrolikii. In their estimation, this geographic population is acting as a functional “species” of sorts, even though it conflicts with the genetic data. And so it would seem that we are right back where we started… is the Cocopeel a species? Does phenotype outweigh genotype, or is it the other way around. And what role does biogeography have to play in such determinations? The answers to these fundamental questions of evolutionary biology may depend on who you ask. In my opinion, neither of these authors make for an entirely compelling case. I fully agree with Delrieu-Trottin when they point out the double standard posed by the “false Lemonpeels” of the Pacific, but, at the same time, it’s hard to make a compelling case for C. cocosensis being a valid evolutionary concept (i.e. a “species”) when its entire geographic distribution lies within a biogeographic area of overlap that leads to incessant hybridization with a species it is genetically identical with. My answer to this conundrum has already been hinted at above. The Cocopeel probably shouldn’t be considered a species. It makes far more sense as a xanthic variation of C. eibli which likely arose through regular hybridization with C. vrolikii at Cocos and Christmas Island. But I also disagree with the conclusion of DiBattista et al regarding the Pacific Lemonpeels. The genetics tell us that the Polynesian members in this group are evolutionarily distinct from other regions. 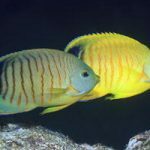 This is a pattern commonly seen in a wide range of reef fish groups, and to ignore it here is to ignore the fundamental rules which seemingly govern how speciation advances in this corner of the world. 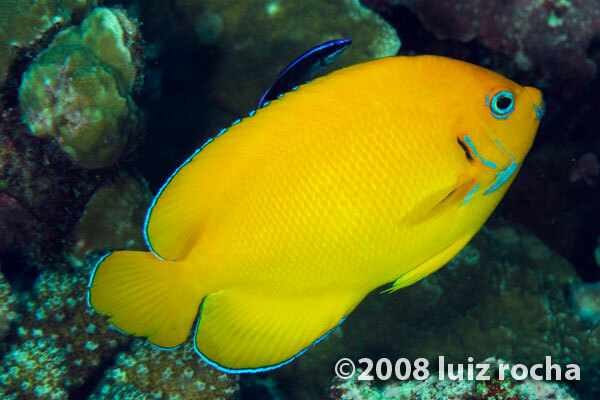 The Polynesian Lemonpeel is distinct and, I would argue, warrants species recognition—this fish has been described in the literature under the currently synonymized name C. luteolus (Cuvier 1831), which has its type locality at Tahiti. Of course, a corollary of recognizing “C. luteolus” would be the need to regard the Lemonpeels found in Micronesia and Melanesia as regional xanthic variants (i.e. 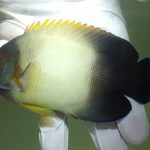 “false” Lemonpeels) of theHalf-black Angelfish, based on their shared genetics and extensive hybridization. This also raises the question of whether or not the yellow coloration of the Micronesian and Melanesian Lemonpeels is a result of hybridizations with the Polynesian Lemonpeels or something that was instead independently arrived at. 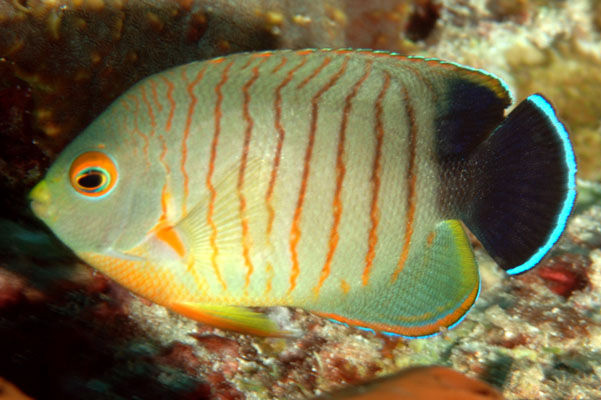 Based on the dispersal abilities seen in similarly distributed groups like the Domino Damselfishes and Roaops Butterflyfishes, the most likely answer is that, on rare occasion, Polynesian Lemonpeels do appear outside their normal range as waifs, hybridizing with the nearby vrolikii-genotype. On an evolutionary time scale, this seems like a plausible explanation for why there would be populations of yellow Centropyge possessing vrolikii DNA, but, as tends to be the case, more study is needed. To end this confusing discussion on a particularly confounding note, C. flavissima was scientifically described prior to C. vrolikii, giving it taxonomic priority were the two to ever be treated together as a single species. 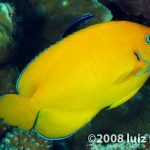 Thus, even though the “false” Lemonpeels might really be Half-black Angelfishes, they wouldn’t be C. vrolikii and would instead keep the scientific name that we’ve always associated with what could be considered the “true” Lemonpeel Angelfish from Polynesia. DiBattista, J.D., Waldrop, E., Bowen, B.W., Schultz, J.K., Gaither, M.R., Pyle, R.L. and Rocha, L.A., 2012. Twisted sister species of pygmy angelfishes: discordance between taxonomy, coloration, and phylogenetics. Coral Reefs, 31(3), pp.839-851. DiBattista, J.D., Gaither, M.R., Hobbs, J.P.A., Rocha, L.A. and Bowen, B.W., 2016. Angelfishes, paper tigers and the devilish taxonomy of the Centropyge flavissima complex. Journal of Heredity, p.esw062. Gaither, M.R., Schultz, J.K., Bellwood, D.R., Pyle, R.L., DiBattista, J.D., Rocha, L.A. and Bowen, B.W., 2014. Evolution of pygmy angelfishes: recent divergences, introgression, and the usefulness of color in taxonomy. 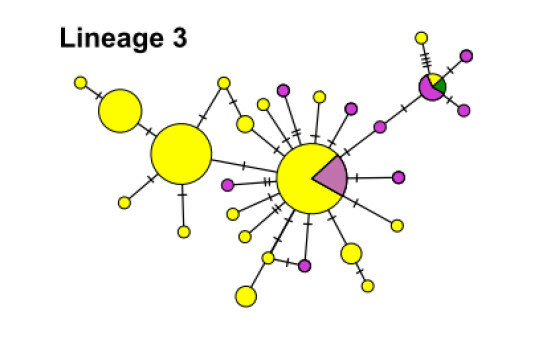 Molecular Phylogenetics and Evolution, 74, pp.38-47. Shen, K.N., Chang, C.W., Delrieu-Trottin, E. and Borsa, P., 2016. Lemonpeel (Centropyge flavissima) and yellow (C. heraldi) pygmy angelfishes each consist of two geographically isolated sibling species. Marine Biodiversity, pp.1-15. Shen, K.N., Chang, C.W., Lin, Z.H., Chan, Y.F., Tsai, S.Y., Chen, C.H. and Hsiao, C.D., 2016. Complete mitogenomes of Cocos lemonpeel angelfish (Centropyge flavissima) and Eibl’s angelfish (Centropyge eibli)(Teleostei: Pomacanthidae). Mitochondrial DNA Part A, 27(5), pp.3709-3710.